- Apostle, brother of Simon Peter, preached Gospel in Greece and the Black Sea region. - Patron saint Fishermen, Russian & Scotland. 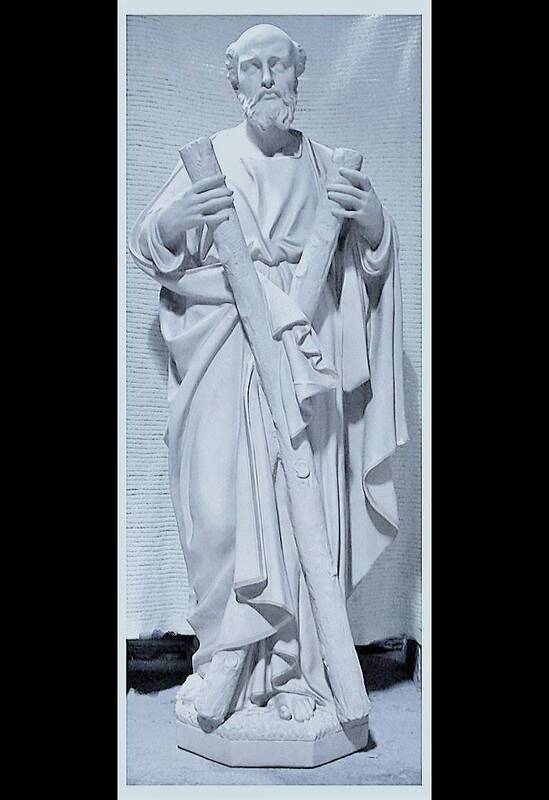 This 60" Fiberglass superb statue features Andrew the Apostle holding the "X" shaped cross upon which he was tied until death, the gaze of holy resignation on his face. Andrew appears in the common garb of his time in the 1st century A.D. NOTE: Each statue is made individually, not mass produced. Please allow 5-10 weeks for delivery, often sooner depending on orders in work shop at the time. Due to the expense of shipping, we do not accept returns/exchanges unless the statue was damaged during the shipping process. This fiberglass statue is white and sealed for indoor and outdoor use. Let us know if you're interested in having this statue painted in natural colors. Beautiful statue delivered exactly as described, and in excellent condition to our church. Octavio and Chris are incredibly knowledgeable about their products and provided quick responses to any questions I had.